Large impact at a small cost! Large postcard printing delivers a big bang for your buck at 48HourPrint.com. Order our large postcards and be confident that our online large postcard printing service delivers more for your money -- high quality large postcard printing at really affordable prices. And you also get the benefit of our industry-leading 48 Hour Turnaround Guarantee for quantities between 500 and 5,000 large postcards and our 24 Hour Turnaround Guarantee for quantities fewer than 500 large postcards printed on our digital press. 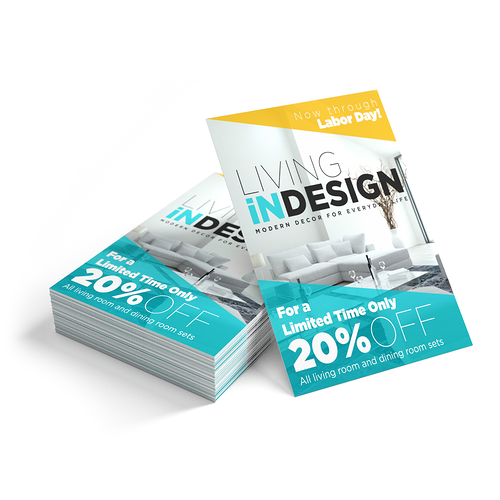 Large postcards command attention and make a significant impact! Large postcard printing -- 8.5” x 11”, 8.5” x 14” and 11” x 17” -- is perfect for making an unforgettable visual impression, conveying complex messages, including detailed information, or just having lots of space to connect with recipients. Use large postcards for direct mail, at a trade show or with other marketing materials. Large postcard printing with C1S (coating on one side) lets you include an order form or space for people to take notes. Preserving the environment is important to 48HourPrint.com. Our large postcards are printed on recycled cover stock, which delivers excellent large postcard printing results on stock that is brighter and more uniform in color. Recycled cover stock is our standard stock, at no extra cost to you. All of our postcards -- standard postcards, mini postcards, large postcards and non-traditional size postcards -- are full color both sides on 14 point cover stock, with your choice of gloss coating, high-gloss U.V. coating, C1S (coating on one side) or matte coating. For promotional tips on using large postcards, check out our postcard marketing ideas and direct mail postcard marketing suggestions. Also review our postcard templates for layout guidelines that will help keep your print job on schedule.